It's taken a while, but the Irish are coming – and this time they're bringing interesting beer. First we had Guinness reverse the trend of decades and add a significant amount of variety to its range, and now it is the turn of 16 year-old Cork microbrewery Franciscan Well to bring its craft beers across the water. Just as it was for Sharp's, one of the attractions for Franciscan Well founder Shane Long was the financial muscle that comes from being part of a multinational. In his case, this means access to the finance he needed to grow FW from its original seven-barrel plant to something an order of magnitude bigger, at 30 barrels. And of course it also means access to Coors' distribution channels, which is how three of his beers were launched on the UK market this month. Initially they will try out in 20 bars around London – “We're in a few select bars to test the market,” Shane said (he also mentioned Edinburgh the last time we spoke). “We are building a bigger brewery now [but] we don't have the capacity yet to supply more.” He added that it also takes time to do the necessary education, training barstaff how to describe and sell the new beers. 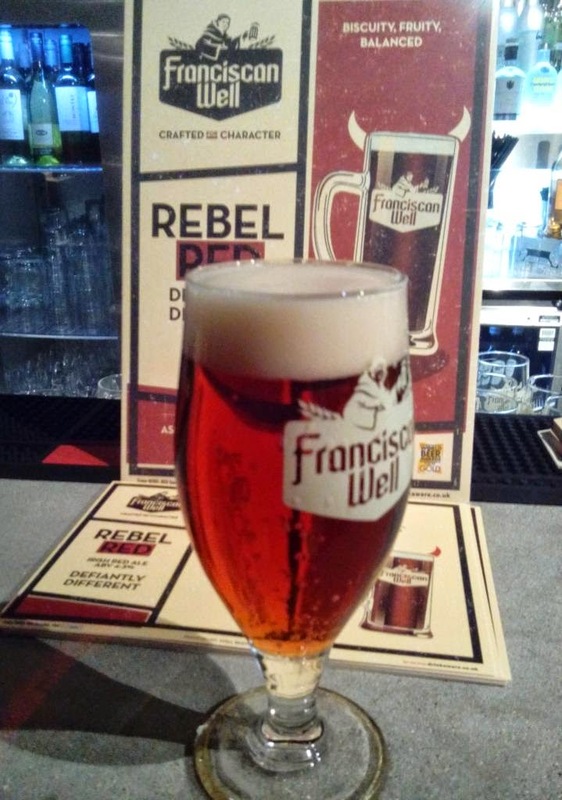 The three Franciscan Well beers coming to London are Rebel Red, Chieftain IPA and Shandon Stout – I'd tried them (plus a couple of others) when I was in Dublin earlier this year, but I was lucky enough to taste them again, partnered with food at a sampling session hosted by Molson Coors. We met up in the basement bar at Smith's of Spitalfields, close to one of London's craft beer foci (and coincidentally just a stone's throw from where Guinness's new Porters had their UK launch event). 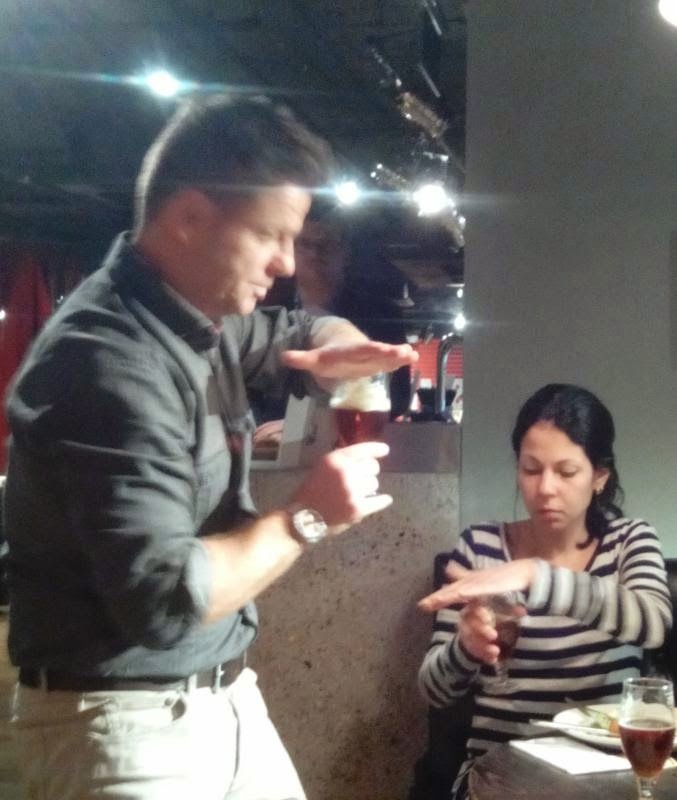 Our main guide for the evening was beer sommelier Des McCann, FW's chief taster and now Molson Coors' Beer Champion (or more formally, head of training and education) for the UK & Ireland. We started out with the Rebel Red (4.3%), in which I found more depth than I remembered. Des said had they'd had an engineer there all day, trying to get things right, tweaking the Red up to 6.5C and the carbonation down, which opens the flavours out a bit more. It was an intriguing hint that even non-real ales can be improved – or spoiled – by skilled cellarmanship. He partnered it with a pulled-pork croquette, so melt-in-the-mouth gorgeous that I snagged seconds. It matched beautifully with the malty Rebel Red. With its notes of biscuit and toffee and its soft East Kent Goldings hoppiness, the Red was reminiscent of a malty bitter or perhaps some of the maltier German Altbiers. Our second beer, Chieftain IPA (5.5%), is one of a new emerging group of mid-Atlantic hybrids. The way Shane now tells it, he asked the regulars at his brewery tap what they didn't like about American IPAs – “too much of a slap across the face” – and also what they didn't like about British IPAs – “too little hop aroma” – and set out to fix those things. “All the things you don't like about the Americans and the British, removed,” he joked. A fairer way to put it might be to say it combines the attractive elements of both styles – the maltier body of a British Pale Ale plus all those lovely American hop aromas and flavours. The reason I suggest there's a new style of sorts emerging here is that Chieftain reminds me in this respect of several other beers from widely disparate origins, such as Scotland's Deeside Swift and Twickenham's new Tusk keg IPA. 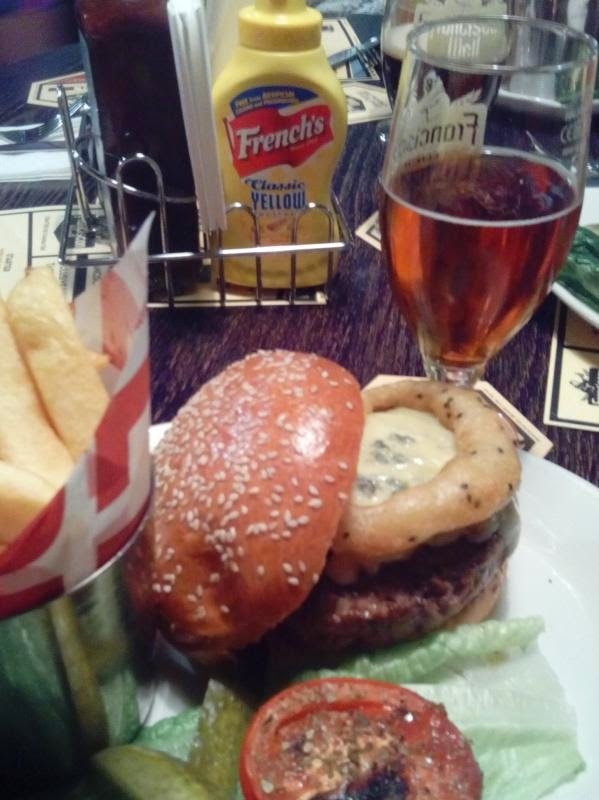 Des partnered Chieftain with a juicy burger, topped with blue cheese, intending this time a contrasting pairing. It worked, but while I enjoyed the IPA's lychee and grapefruit aromas I found it too gassy. Des reckoned that being a bit higher in alcohol it needed the higher carbonation to “pull the body through a bit more.” Well, maybe! Either way, it's a sessionable (just about!) IPA that works well with food. 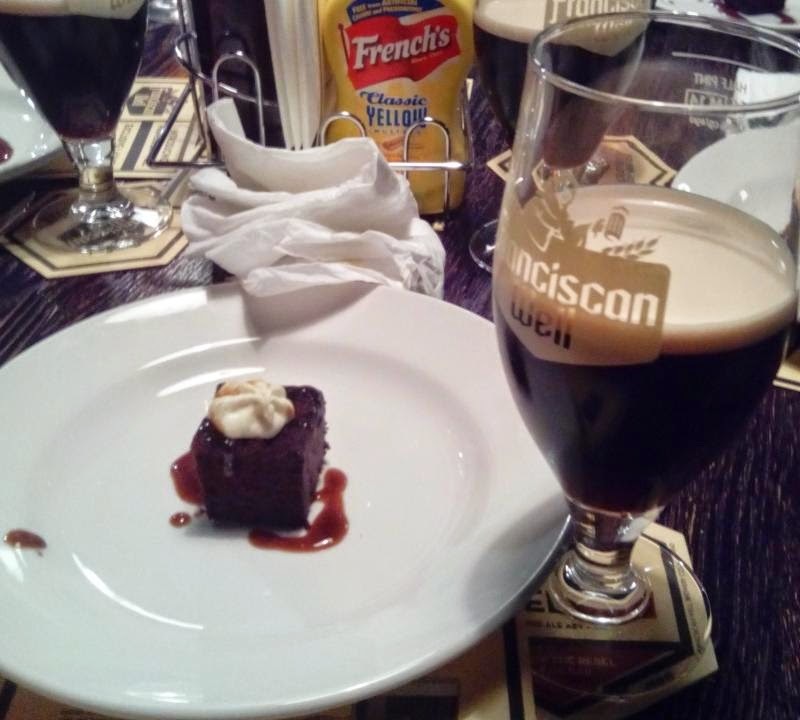 The final course was another complementary pairing: Shandon Stout (4.2%) with a bijou chocolate & stout cake. While its strength perhaps puts it more in Porter territory, this beer fits the style Shane's aiming for, which is a Cork dry stout, along the lines perhaps of Beamish. There's hints of coffee and cream in there, plus fainter notes of green apples and smoky bacon, and a dry burnt-bitterness. The overall effect was quite mild and some might say watery, reminding me of soft-bodied hybrids such as Schneider's Porter Weisse. Chatting with the bar's beverage manager on the way out, he said Smith's would have the stout in the Spitalfields branch and both the stout and IPA in the Smithfields branch. His customers, he said, are a mix of same-again types who looks for known brands, and those willing to experiment, so the challenge is to balance the two without alienating either. Now, as well as the excellent 7.8% Jameson-aged Shandon Stout that I tasted in Dublin, there is a 6% barrel-aged version of his Purgatory Pale Ale (normally 4.5%). Shane said this is a special for some of the pubs on the Irish Whiskey Trail around Midleton in West Cork – Midleton being where Jameson's is now produced and the home of the Jameson Experience.